As of 4/7/2019, conditions have been changing quickly and fishing of any sort if difficult right now. Access to the ice is very tough due to melting shorelines with about 10 feet of open water between shore and the shelf of ice. With that being said there is still not quite enough open water in most areas of the lake for shore fishing. The few anglers that have been able to shore fish the small stretches of open water have reported success catching small Rainbow Trout. Look for the next few weeks to provide very good pike fishing opportunities while the fish are shallow for the spawn. As of 4/11/2019, the ice is starting to pull away from the shore, reports of as much as 30 feet of open water between the shore and ice sheet. The south shore has slightly better access onto the ice however that is quickly deteriorating as well. Anglers are having limited success using jigs fished mid water column. To be successful currently anglers must be in a good cruising area for trout where it is most likely to have fish come through and feed. As of 4/7/2019, water temp is about 40 degrees. Generally fishing has been slow with some anglers reporting a few catches of walleye, crappie, and wiper. The water clarity is becoming poor with less than 1 foot of visibility. As the season progresses expect fishing to pick up as the water temperatures rise. Reservoir is OPEN to BOATING. The Inlet is ON and the Outlet is OFF. As of 4/8/2019, water temperature was near 50 degrees and fishing reported fair to good for bluegill and trout. Trolling seems to be the ticket early in the year. Anglers are reporting good success catching trout and walleye trolling crankbaits at various depths and speeds. The walleye seem to be deeper in the 20 to 30 foot range while the trout are much closer to the surface. The main boat ramp and Heron Cover (north) ramp are open for launching. Boat Inspectors will be available at the ANS Inspection Station from 7:00am-7:00pm during the month of April. Decontamination hours are 8:00am-6:00 pm. As of 4/8/2019, surface water temperature is approximately 50 degrees. Fishing has been slow to good for crappie, walleye, saugeye and wipers. Most of the wiper action has been reported near the inlet while the walleye action is closer to the dam. As of 4/11/2019, there are 11 fishable ponds at St. Vrain, which are stocked on a regular basis. St. Vrain is one of the best locations for anglers to really get into a mixed bag of species. With water temperatures on the ponds increasing trout are active as well as many warm water species becoming active. The recent cold front has definitely slowed the bite for many species however; Anglers have still reported some success catching panfish, bass, and even some saugeye. As of 4/8/2019, access to the ice is nearly impossible. Anglers looking to get onto the ice are encouraged to be very cautious. Recent reports show that there is upwards of 10 feet of open water between shore and the ice around nearly the entire lake. Look for early open water pike fishing to be very successful as the pike are shallow feeding in preparation for the upcoming spawn. Anglers should also be able to have good success from shore fishing for trout with spoons and spinners. As of 4/10/2019, fishing at the reservoir is really starting to pick up. Water temperatures before the recent cold front were approaching 50 degrees. Anglers have been reporting success catching walleye, bass, crappie, and wiper. Anglers have been catching crappie in the back of coves near submerged trees. Walleye have been caught jigging main lake points and secondary points as well. Walleye anglers are reporting the best pattern has been a jig head with a 3 to 4 inch paddletail. Bass should be sliding up shallower and shallower as the water warms. Be sure to check the 2019 Fishing Brochure for updates on new Pueblo Specific Regulations for 2019. Boat Ramp/Inspection Station hours are currently 5:00am - 11:00pm. As of 4/7/2019, the lake is at 765 surface acres with a surface elevation of 6187.66. South Shore fishermen are catching Rainbow Trout on PowerBait. The Rainbow Trout are ranging in size from 12 to 15 inches. Boaters are having excellent success catching trout. Trolling with worms or spinners seems to be the go to rig. No reports of any perch or walleye being caught. The perch and walleye fishing should improve as the water continues to warm. The boat ramp is open, inspection hours are from 8:00am to 4:00pm daily. If there is not an inspector at the ramp, please call the ranger cell phone numbers at 719-859-0480 or 719-989-7194 or the visitor center at 719-846-6951 from 8:00am to 4:00pm. This 762-acre impoundment is located off of E. Quincy Avenue, two miles east of E-470. Open to boating. Electric trolling motors only. As of 4/8/2019, water temperatures ranged from 45 to 50 degrees. Trout scattered throughout the lake with some nice fish around 18 inches being caught. Yellow Perch and Walleye also scattered but holding in the deeper water around 30 feet. Anglers reporting some success catching walleye on jigs or blade baits. For more information, call 303-326-8425. Park hours April 6:00am-8:30pm. This 881-acre impoundment is located in Cherry Creek State Park, in Aurora. There are two entrances to the park, the east entrance off S. Dayton St. and the west entrance off S. Parker Rd. The lake opened for boating on March 28th. As of 4/10/2019, anglers have reported success fishing for walleye at night trolling jerk baits slowly just below the surface. During the day walleye anglers are trolling much deeper in front of the dam focusing on the fish that are feeding out in the open basin of the reservoir. There have been some reports of crappie being caught as the water warms near 50 degrees. 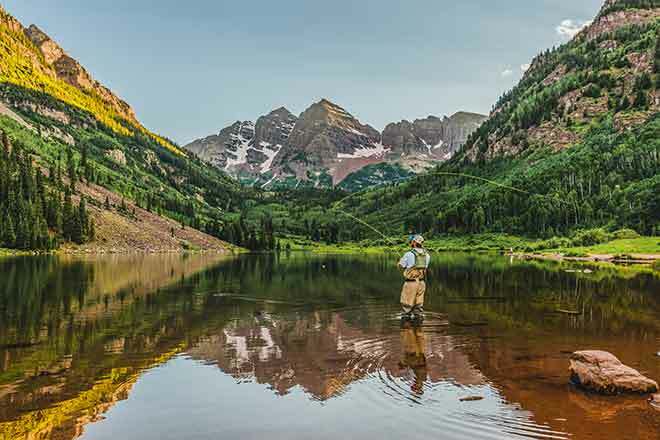 Fishing for trout has been consistent with anglers catching fish on a variety of lures or baits including casting spoons and in-line spinner baits. There have also been a few reports of anglers catching some crappie in the shallower sections of the reservoir where the water tends to be a bit warmer. This 1,356 acre impoundment is located in Chatfield State Park. As of 4/10/2019, water temperatures are starting to hit 50 degrees in the afternoons. With the warmer water temperatures anglers targeting bass have been able to catch a few along the rocky shorelines. The best baits for the Smallmouth right now is jerk baits fished slowly with longer pauses between jerks. Anglers targeting walleye are still having the most success at night trolling crankbaits in the shallow water. Walleye have been caught on a variety of baits from smaller shad profile baits to larger minnow profile stick baits. Anglers reporting walleye still in all phases of the spawn. Look for the pre and post spawn fish to be feeding most heavily. Daytime walleye bites are expected to pick up soon with fish moving off the dam from spawning and spreading out onto their typical summer structures. Fishing for trout has been fair to good off shore, anglers are catching fish with baits such as smaller inline spinners, Kastmasters, or jerk baits. Opened March 1st. As of 4/8/2019 open to boating. Electric trolling motors only. Bass fishing slow to fair using lipless crankbaits. Reminder that the reservoir is restricted to artificial flies or lures only. Only watercraft capable of being launched by hand permitted. Vehicles and trailers are not permitted in the water. The water level is down a few feet from full pool and the clarity is being reported as off color with a visibility about 3 feet. Anglers have had some early success for bass with jerk baits fished slow or finesse jigs along the bottom. For more information, call 303-326-8424. Park Hours April 6:00am-8:30pm. As of 4/10/2019, Open water holes are starting to appear. The main sheet of ice still ranges from 20 to 22 inches thick however access to the ice is becoming more and more difficult as the shores continue to thaw. Recent warm weather with the exception of Wednesday's storm is causing the melting process to happen fairly rapidly. For anglers that have ventured onto the ice recently the fishing remains slow overall with sporadic success. As always with late ice season anglers are strongly encouraged to have and use all safety equipment necessary. As of 4/10/2019, the ice conditions at Delaney Buttes are very similar to those of Lake John. Anglers are advised to be very cautious if venturing onto the ice. Anglers have reported some success using small flies through the ice. Generally the bite at Delaney Buttes is also much slower than it has been for a majority of the winter. As of 4/8/2019, Please take extreme caution while ice fishing. Anglers are still going out at the inlet, Morrison Cove Keystone and marina areas. Please review the ice conditions section below. Many anglers are having luck at the Inlet, Lot14, and Lot16 area. Successful anglers are primarily reporting luck with PowerBait, PowerGrubs, nightcrawlers, mealworms, spoons, & jigs. Ice conditions; folks are still going out but it's getting pretty sketchy. Shorelines are the thinnest 0 to 4 inches and when you get on the main ice it's 8 to 12 inches of slush on top of 10 inches of ice. Please use EXTREME caution if you decide to go out and please use late season precautions such as wearing a PFD, going with a partner, having ice picks, and a spud bar to check the ice as you go out. As of 4/10/2019, recent report is that the ice is still holding up well on Blue Mesa. Anglers have been reporting decent success targeting Kokanee Salmon as well as Rainbow and Brown Trout. Anglers are reporting most of the success on jigging spoons fished mid water column. As with any late ice season situation caution is advised and it is always recommended anglers travel with all necessary safety equipment. As of 4/10/2019, anglers are beginning to have success catching bass as well as crappie. The key to success seems to be targeting the shallow water that warms faster. Remember that there is a lake specific limit on the bass. They must be 18 inches or larger to keep, and you can only keep ONE. Statewide limits pertain to all other species.